"An American-style potato salad, with a twist - roasted Hatch chiles!" Place potatoes and 2 tablespoons salt in a large pot and cover with water; bring to a boil. Reduce heat to medium-low and simmer until fork-tender, 6 to 8 minutes. Drain. Transfer to a large bowl and set aside to cool. Place chile peppers cut-side down on baking sheet and lightly brush skin with oil. Broil in the preheated oven until skin is heavily blistered and turning black, 12 to 15 minutes. Transfer to a bowl and cover tightly with plastic wrap. Allow peppers to steam as they cool, about 15 minutes. Peel and chop the chile peppers. 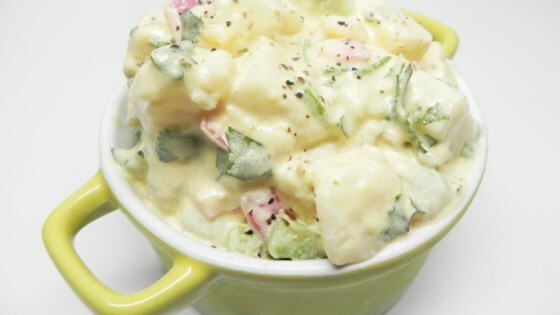 Whisk mayonnaise, parsley, peperoncini peppers, mustard, lemon juice, pickle relish, and remaining 1 teaspoon salt in a small bowl to make dressing. Pour dressing over cooled potatoes. Add chile peppers, celery, and onion; mix to combine. Season salad with black pepper. Chill in the refrigerator before serving, about 30 minutes. If Hatch chiles aren't in season, you can experiment with some other type of medium to large-sized green pepper (such as Anaheim peppers), or the recipe is just fine with the peppers omitted. Nutrition data for this recipe includes the full amount of salt for boiling potatoes. The actual amount consumed will vary. Added one more Hatch chile; otherwise, I made no changes. We thoroughly enjoyed it. I served it with my recipe meatloaf stuffed with ham, salami, cheese, mushrooms, and roasted peppers.